Long before the cancer that was grunge became associated with Seattle, WA, Culprit was the kings of the Seattle scene. Originally released in 1983 on Shrapnel Records, my first exposure to this band was on the U.S. Metal Vol. 2 compilation. 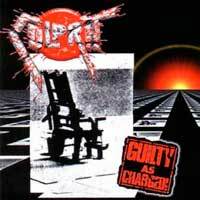 As I recall, Culprit had good company on that compilation with the likes of Exciter, Wild Dogs and Virgin Steele. 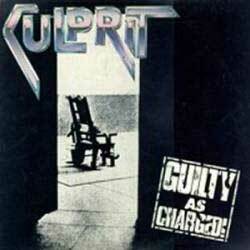 As with those bands, culprit are classic heavy metal. 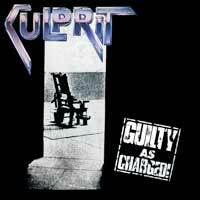 "Guilty As Charged" is a solid metal platter with a technical edge, screaming vocals by Jeff L'Heureux, and top-notch guitarwork from from the duo of Kjartan Kristofferson and John DeVol. Shrapnel has always been a label with the reputation for releasing guitar driven, shred metal albums. While Culprit are most certainly heavy and guitar driven, they are more song oriented than the average Shrapnel Records band. Culprit were apparently very popular in their area and inspired a number of followers including Heir Apparent and Queenryche. Unfortunately this was their one and only full length release.